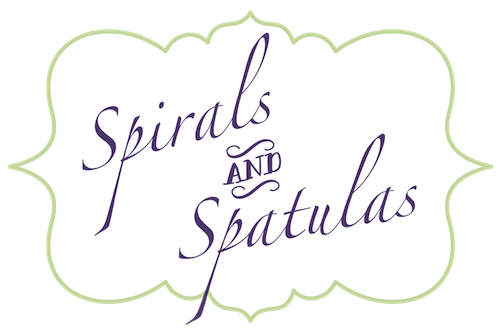 Spirals & Spatulas: China and Crystal and Cabinets, Oh My! 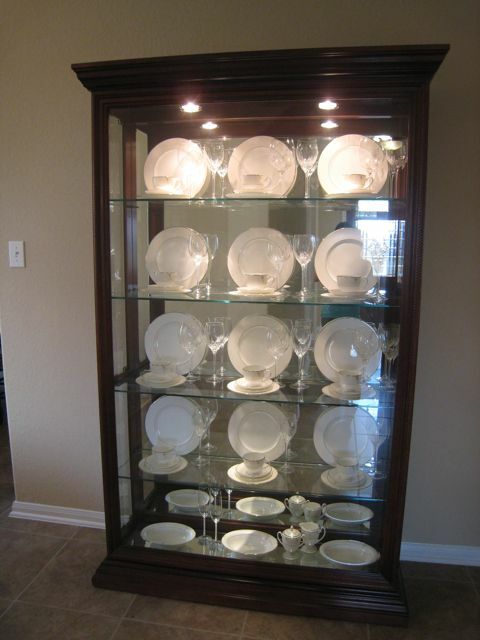 My parents gave us this beautiful china cabinet. They moved into a new house about three years ago, and it's been sitting in their garage ever since because there just isn't a place for it in their house! We were thrilled to have it! After three years of sitting in a garage, it needed some serious dusting and Windex-ing, but I finally got it all shiny again! 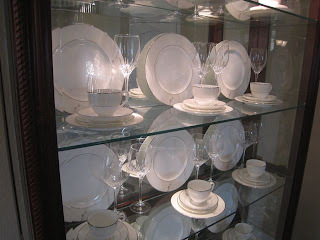 We put all the shelves back in, and then I got to work unpacking our china and crystal. We received twelve place settings of our china as wedding gifts, plus some serving pieces, but it had all just been sitting in a closet at my parents' house ever since. I'm so excited that it's finally out of the boxes and in a place where we can see it! 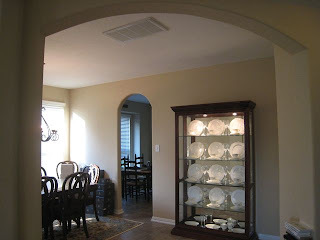 The glass shelves have little grooves in the back for standing up plates, so I just stood up the dinner plates and stacked everything else in front. 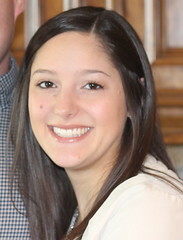 I think they look so pretty! 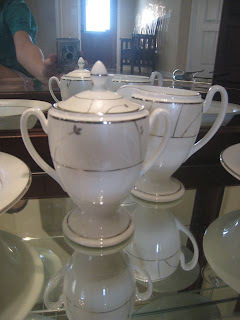 I enjoyed getting to look at all of our china again... I love this little cream & sugar set SO MUCH! When I unpacked our toasting flutes from their box, I was greeted by a not-so-lovely surprise... apparently they were never washed after the wedding (and that was oh, about 10 months ago)! There was brown crystallized champagne gook on both on them... so gross! But, it was nothing a little Palmolive couldn't fix, and I had them looking shiny in no time! 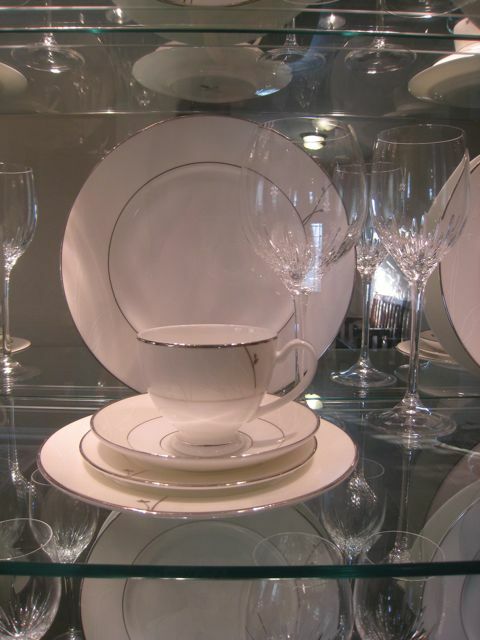 Summary: It's silly to have your wedding china and crystal sitting in a closet, it's much better to have them out where you can enjoy them, and you should check your toasting flutes for gross almost-a-year-old champagne residue! 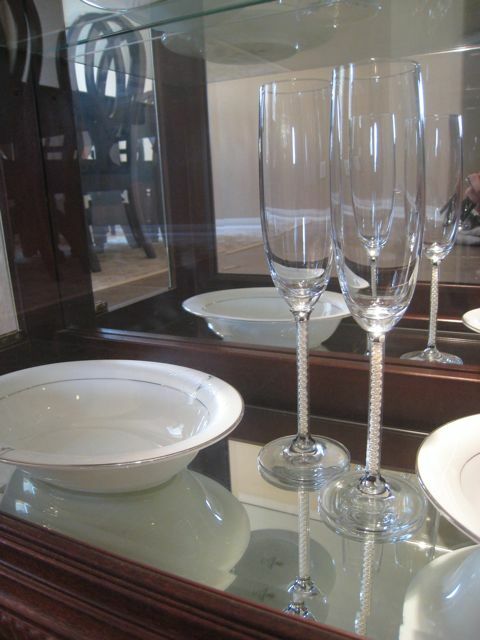 Are those the Lenox toasting flutes with pearls in the stems?! If so, we had the same ones at our wedding and we had champagne in them on our anniversary a couple weeks ago!